Pics under "Read More" Break. Chris Hemsworth has been spotted channeling his inner racing driver on the set of "Rush". In the photo taken during the filming in London on Thursday, March 8, the actor is featured donning a red jumpsuit and a long blonde hair to resemble British Formula One driver James Hunt. In some other pictures obtained byComing Soon, the titular hero in "Thor" is seen posing next to a blonde beauty who rocks a red shirt and a white cowboy hat. In another shot, meanwhile, the Aussie hunk sports a casual outfit consisting of a blue shirt and matching pants while walking around the set which is seemingly arranged to look like a scene of an accident. It would seem that Chris Hemsworth has grown quite accustom to wearing his hair long. While the next time we see him - in next month's Cabin in the Woods - the actor will be sporting a fashionable buzz cut, the actor best known to audiences as Thor will be sporting long locks in both Joss Whedon's The Avengers and this summer's Snow White and the Huntsman. Apparently he hasn't found a reason to cut them off just yet, though, as new images from the set of Ron Howard's Rushhave revealed that long-haired Chris Hemsworth is all were going to be seeing for the near future. 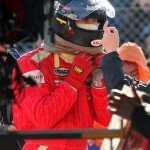 More Pics of Chris Hemsworth on the Set of Rush!! He is one of the most legendary racing drivers of all time. And now the life and career of James Hunt is set to be told in a new movie, with Australian actor Chris Hemsworth taking on the role of the Formula 1 icon. 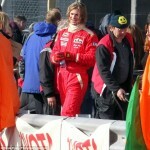 In the first shots taken on the set of upcoming movie Rush, Thor star Chris looks the spitting image of Hunt, with his mop of long blonde hair and in his red racing suit. The movie, written by The Queen and Frost/Nixon writer Peter Morgan, tells the story of three-time F1 champion Niki Lauda, who returned to the racing track six weeks after a near-death experience in his Ferrari in 1976. Rush follows the tale of Lauda's rivalry with Hunt when he makes his racing comeback to battle Hunt for the F1 championship. A couple of days ago, we out up the news that principle photography had begun on the new Ron Howard directed Formula One movie, Rush.The movie takes us back to F1 in the 70s and focuses on the fierce rival between British driver, James Hunt (played by Chris Hemsworth) and German driver Niki Lauda (played by Daniel Brühl). Suffice to say, I’m very excited to see it. Huff Po have snapped the first image from the set of the movie which is shooting here in the UK of Chris Hemsworth in his 70s F1 authentic gear all set to play Hunt in the movie and I’ve placed it below. I’ve also added an image to the right of the real James Hunt and I think you’ll agree, Mr Hemsworth looks rather a lot like him! Formula 1 racing great James Hunt's story is coming to life on the big screen in Rush, with Oscar winner Ron Howard directing from a script by Peter Morgan (the two previously worked together on Frost/Nixon).Rush will focus on the 1970s rivalry between Formula 1 drivers Hunt and Niki Lauda, with Thor star Chris Hemsworth cast as James Hunt and Daniel Bruhl (Inglourious Basterds) playing Austrian driver Niki Lauda. Filming is currently underway, with shooting set to take place in the UK, Germany and Austria. The cast of Rush also includes Olivia Wilde and Alexandra Maria Lara. Andrew Eaton, Ron Howard, Brian Grazer, Eric Fellner, Peter Morgan and Brian Oliver are producing, and Universal Pictures will be distributing the film in North America.